Download data retrieval application easily saves and views your recovered pictures and snapshots at specified storage location. Free data salvage utility revives all misplaced text documents from USB devices. 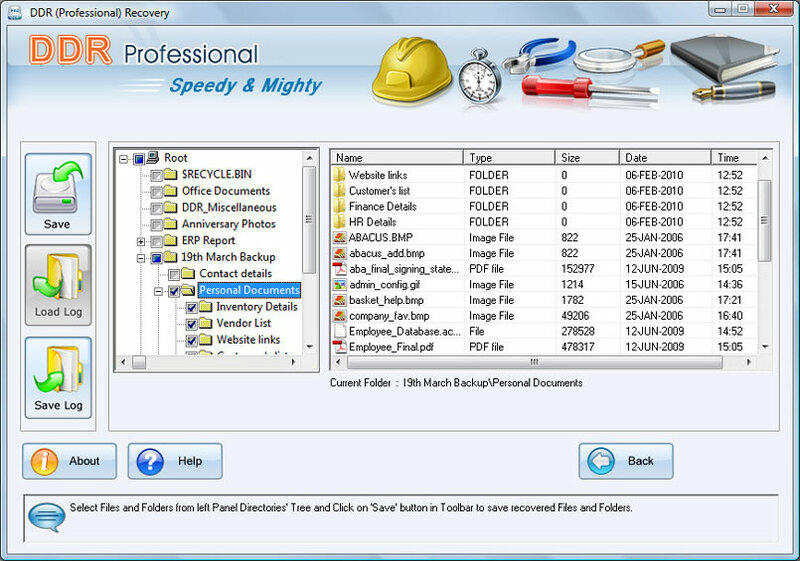 Professional data recovery software retrieves corrupted digital pictures, image, mp3 song, audio, video clipping, music collection from inaccessible hard disk drive, memory card, thumb drive, mobile phones, pen drive and other storage media. ...... USB storage device and Windows partition. Professional data recovery program provides advance data backup facility to easily show recovered data in hierarchical structure or tree structure. Advance data retrieval utility is simple and secure tool to revive lost, deleted music collection, video clips from crashed removable media and iPod media players. Download data retrieval application supports different type of branded USB drives like Samsung, Panasonic, HP, Toshiba, Canon, Sony and Nikon etc. File restoration program runs under all Windows operating system such as 98, 2000, XP, Vista and Window 7. DDR Professional Recovery is helpful tool to revive different file formats such as midi, jpeg, doc, gif, ppt, wma, mp3, mp4, mpa and mpeg etc. * Download data salvage program retrieves all corrupted files, folders from damaged storage media. Qweas is providing links to DDR Professional Recovery 4.0.1.6 as a courtesy, and makes no representations regarding DDR Professional Recovery or any other applications or any information related thereto. Any questions, complaints or claims regarding this application DDR Professional Recovery 4.0.1.6 must be directed to the appropriate software vendor. You may click the publisher link of DDR Professional Recovery on the top of this page to get more details about the vendor.